As we move rapidly towards a new year, new goals, new plans – ladies and gentelmen, I give you the very tools of productivity… our new committee members. Following this years AGM last Wednesday 23rd November 2016 – the minutes and overview have been circulated out to members using the BC management portal. Eleven Committee members and ten others were in attendance. The evening took the form of a short presentation, review of finances, and the discussion points for the evening. Under 18’s up to 54 – a growth of 38% since last year. VC Melyd have delivered six Go Ride Race events were delivered – four more than last year. 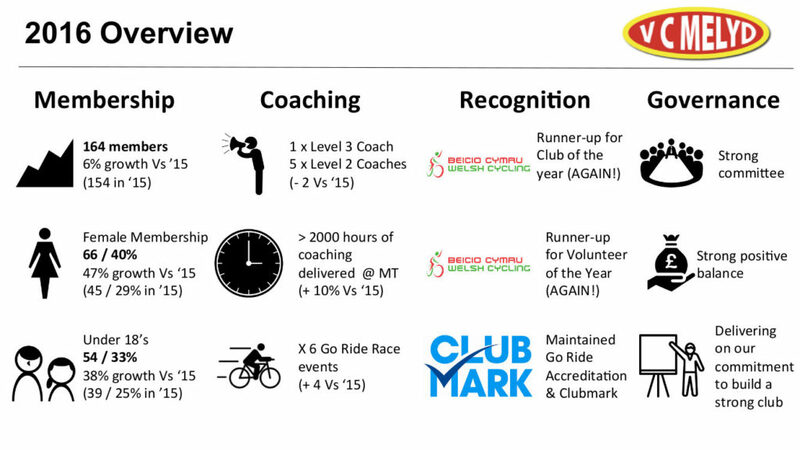 Welsh Cycling Volunteer of the Year – nomination – and runner up again. Question on membership split by age – total club membership is 164 – female splits as 39 over 18 and 27 under 18 and male splits as 71 over 18 and 27 under 18. Discussion around how to attract an under 18 member onto the committee to fill the Junior Secretary position – Chris Winn and Alex Clewett to address via the young ambassador program. Agreed that we’ll keep going with the rota system (can those that do ride regularly please do help). We will stick with one planned route until the 26th March (when the clocks change) – then go back to two routes. During the winter we should try and maintain a cohesive group on the road. Those wanting a faster winter ride will have the option of rendezvousing at the café – Alan is likely to lead these rides. For those selecting which ride to do, they should be respectful of the estimated average speed and pick routes that are achievable – this should avoid frustration on all sides – some updates will be suggested for the website. Route planners should also plan sensibly. We also asked that route planners do actually ride on the day – if they are not available – they should swap with someone who is going to be there. Winter training camp – target w/c 11th March – Alan to arrange FB posting to capture likely numbers (£500 based on two sharing a room, £575 single occupancy – plus fligts). Discussed providing more content for the web site – some of the above will lead to some update, but more news articles etc. are requested. Social rides / quiz nights etc. with other clubs discussed – Alex & Steve to plan. Mince pie bimble – 24th December – 10am from the Nature Reserve – then back to #13 for mince pies etc – collection this year in aid of St. Kentigerns. Turkey ride – 28th December – Steve to confirm details. A huge congratulations to this year’s award winners. 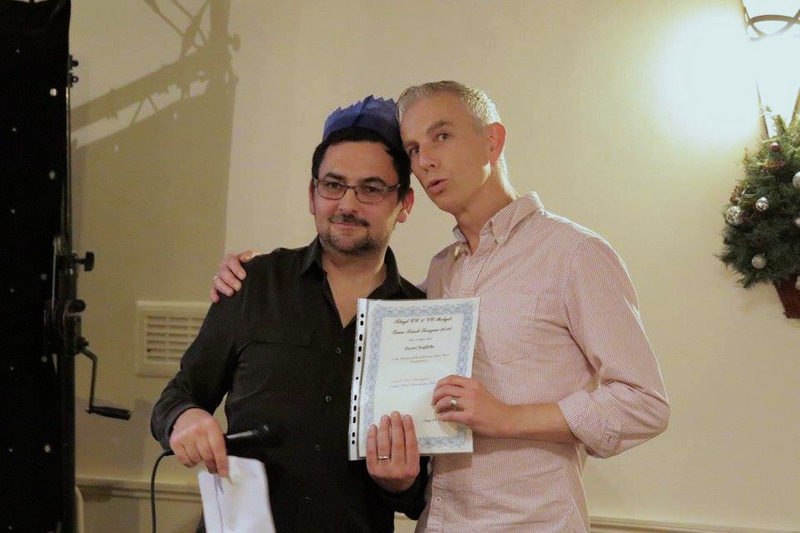 The culmination of a year’s worth of riding and a fantastic social evening saw the following people take receipt of our … quite frankly ASTOUNDING awards … hand fettled by the artisan and renown local sculptor – Mr Alan Overson. Hearty congratulations to everyone who took part in this year of riding and contributed in any way, no matter how small to the running of our fantastic and award winning club. Thank you. Now… on with the festivities! This week saw the announcement of the 2016 Annual General Meeting for VC Melyd. Posted to Facebook, with agenda’s sent to users, and using the British Cycling Membership mail list. Please find a copy of the agenda below, and be sure to get back to Mark directly or in reply on Facebook so we have an idea of how many are going to be in attendance. All who cannot be there – but have points to raise – be sure to get these down in advance, and over to Mark or someone going in your place. 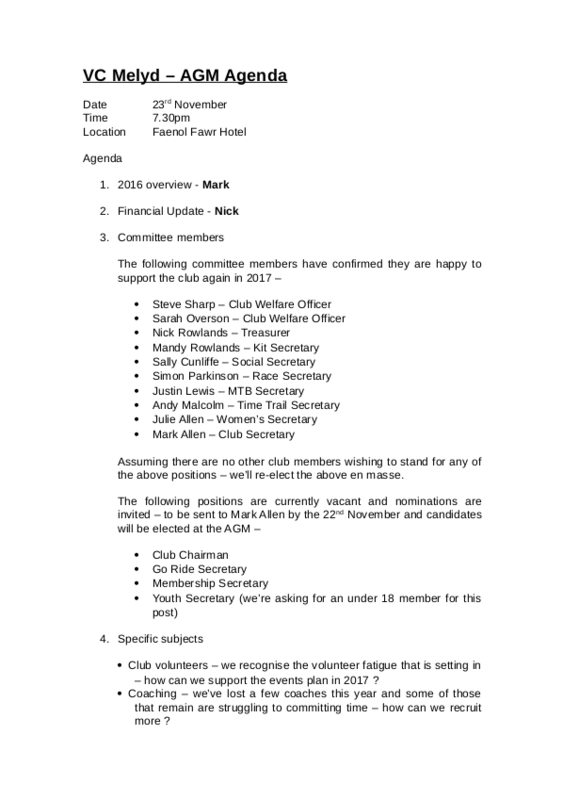 This is your club, and your opportunity to voice concerns, ideas, and take an active roll in where this award winning club is going to. Sally, our social secretary has posted this to the FB group. Should you require any further information do not hesitate to get in touch directly. 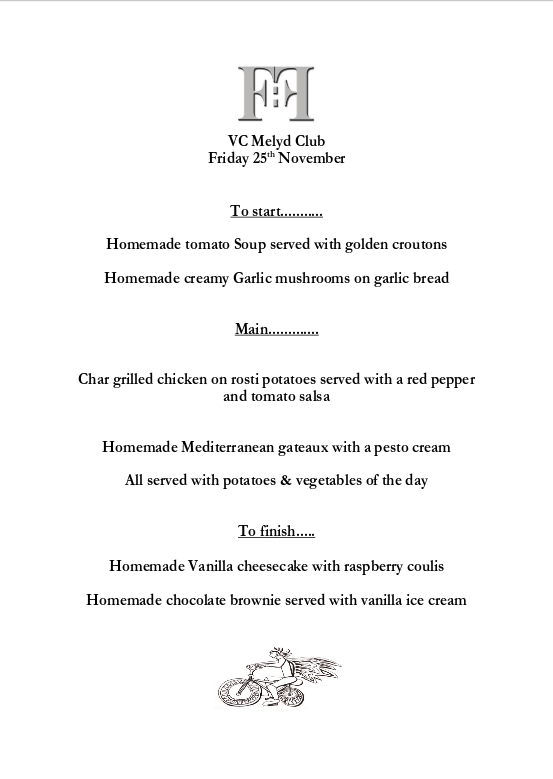 “Annual VCM Awards Dinner on Friday 25th November 2016 at the Faenol Fawr, Bodelwyddan. £25 per person payable to the club (please PM me for details).